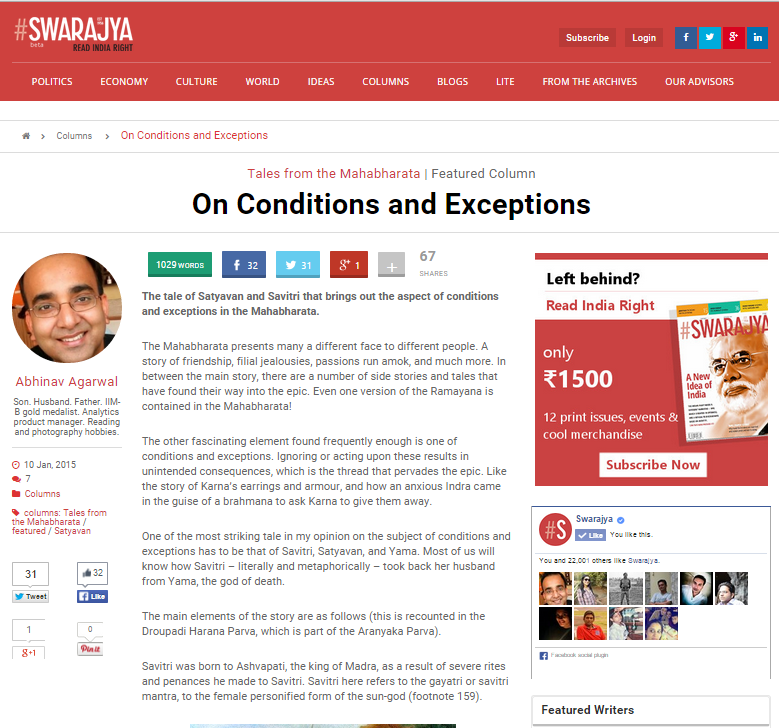 Tales from the Mahabharat, Episode 7 - Of Conditions and Exceptions - my seventh installment of "Tales from the Mahabharata" was published in the Swarajya Magazine on January 10, 2015. The Mahabharata presents many a different face to different people. A story of friendship, filial jealousies, passions run amok, and much more. In between the main story, there are a number of side stories and tales that have found their way into the epic. Even one version of the Ramayana is contained in the Mahabharata! The other fascinating element found frequently enough is one of conditions and exceptions. Ignoring or acting upon these results in unintended consequences, which is the thread that pervades the epic. Like the story of Karna's earrings and armour, and how an anxious Indra came in the guise of a brahmana to ask Karna to give them away. One of the most striking tale in my opinion on the subject of conditions and exceptions has to be that of Savitri, Satyavan, and Yama. Most of us will know how Savitri - literally and metaphorically - took back her husband from Yama, the god of death. The main elements of the story are as follows (this is recounted in the Droupadi Harana Parva, which is part of the Aranyaka Parva). Savitri was born to Ashvapati, the king of Madra, as a result of severe rites and penances he made to Savitri. Savitri here refers to the gayatri or savitri mantra, to the female personified form of the sun-god (footnote 159). She married Satyavan, the son of the blind king of Shalya, Dyumatsena. This was despite Sage Narada's words that Satyavan was fated to die in one year - his only "fault". On the fateful day, Savitri accompanied Satyavan to the forest, where he developed a headache, lay down in Savitri's lap, and fell into a sort of a sleep. It was then that Yama appeared before them, bound Satyavan's life with his noose, and walked away. As he walked, Savitri followed him. Yama was pleased by Savitri's devotion to her husband, and also her intelligence. Savitri told Yama that "friendship is established by walking seven steps with another." Yama responded by telling her, "Ask for a boon, other than his life." Savitri asked for her father-in-law's sight to be restored. And thus it came to be. Savitri then told Yama that communion with the virtuous was never fruitless. Yama, delighted, granted Savitri a second boon, "Other than Satyavan becoming alive, ask for a second boon." Savitri asked that her father-in-law get his kingdom back. Savitri ignored Yama's entreaties for her to return, and talked about the conduct of the righteous. Yama granted Savitri a third boon thus - "Other than Satyavan's life, ask again for any boon you desire." Savitri asked that her father have a hundred sons. So far, Yama had granted three boons to Savitri, and each time Savitri had asked for something, not for her but for Satyavan's father and then for her father. Though she walked for a long distance, she was not tired, and her mind traveled a "greater distance." She continued to speak on dharma, and Yama was pleased again. He granted Savitri a fourth boon - "Other than his life, ask for a fourth boon." Savitri asked for a hundred sons through "Satyavan." Bingo! No, not quite. Because here you had what would qualify as a near-perfect paradox. Yama had placed a condition that Savitri could not ask for Satyavan's life, yet Savitri had asked for a hundred sons through Satyavan! Yama acceded and granted her the boon that should would have "one hundred" sons. We can split hairs on this one, and perhaps venture into the wonderful world of maya and more, but the point is that even if Savitri somehow got the hundred sons she had asked for in her boon, it was no guarantee that Satyavan would get his life back. Equally importantly, Savitri had respected the conditions that Yama had put on his boons. And thus we move to the fifth boon. After hearing Savitri's continuing words of wisdom, Yama could not hold back and granted her a fifth boon - "O one controlled in vows. Ask for an unmatched boon." Savitri seized the moment. She replied, "You have not made an exception to your favours, as you did with the other boons. Therefore, I ask for the boon that Satyavan should live. ... It is then that your words will come true." Yama knew he had been cornered; he agreed, and thus Satyavan got his life back. This story of Savitri brings home several insights. The power of perseverance for one. The power of words for another. Most importantly, the value of respecting someone's words and seizing the right moment at the right time. Savitri walked with the god of death over a long distance. During this period she kept Yama in good humour by talking words of wisdom. Words that Yama confessed that he had "never heard, from anyone else." Yes, one could facetiously argue that the god of death was not likely to be hearing words of wisdom, or any words for that matter, from those that accompanied him, but that would be facile. Not once did Savitri badger Yama into granting Satyavan back his life. And when Yama slipped, Savitri had the presence of mind to seize the moment. Therefore, not just devotion, which Savitri possessed in plenty, or wisdom, which also she evidently had, but it her intelligence which makes her truly worthy of worship. By the way, did you know that Satyavan was also known as Chitrashva, because as a youth he was fond of horses and made clay horses that he then painted? Note: I have used Dr. Bibek Debroy’s “Mahabharata”, Vol. 3, an unabridged English translation of the Critical Edition of the Mahabharata, published by Penguin India in 2011, for reference. The story here is described in the Droupadi Harana Parva. This is the forty-third of the minor Parvas, and is contained in the Aranyaka Parva, the third of the major parvas of the epic. The story here is described in Chapters 277 through 281 of the Aranyaka Parva.